BUENOS AIRES, Argentina — After the rain, the fire. Boca Juniors and River Plate drew 2-2 Sunday in a passionately fought first leg of the Copa Libertadores final that was delayed by a day because of thunder, lightning and a torrential downpour. The two Argentine teams hold one of the fiercest rivalries in soccer and the two-leg final has been called "The Game of the Century" because it's the first time that they have met in the final of South America's equivalent of the Champions League. Visiting supporters were not allowed at the game because of the fear of potential violence. But home fans at a sold-out La Bombonera Stadium roared when Boca forward Ramon Abila opened the scoring in the 34th minute with a powerful left-footed shot into the top left corner. 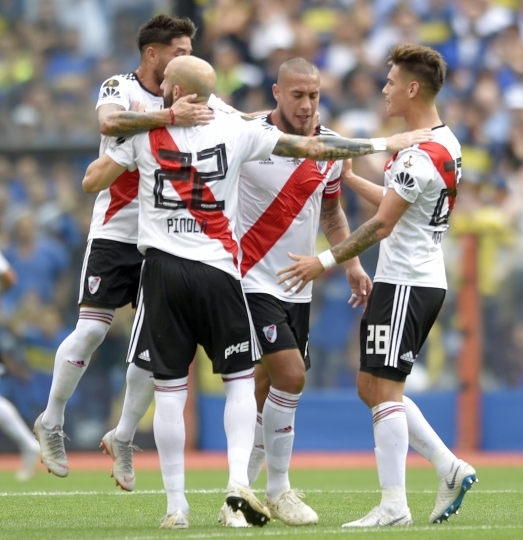 Two minutes later, the deafening noise turned to near silence as River striker Lucas Pratto equalized, sending the ball into the bottom left corner. Forward Dario Benedetto made it 2-1 to Boca with a header in first-half stoppage time before Boca defender Carlos Izquierdoz scored an own-goal in the 61st minute as he tried to deflect a free kick with his head. Benedetto's goals had helped Boca reach the final. He proved himself again when he came into the game in the 20th minute after Cristian Pavon left the field in tears after he pulled a muscle. "Both teams had a good game and the result was fair for both," Benedetto said. "I think Boca's soccer was better but River also had its merits." River dominated the start and had the clearest chances but Boca goalkeeper Agustin Rossi made a series of superb saves. "The Boca goalkeeper had two or three spectacular saves ... We were shooting to goal well but he was saving some very good shots," said Pratto, who was chosen as man of the match. "It was very good to draw the game and we hope that in the next one we can be champions." 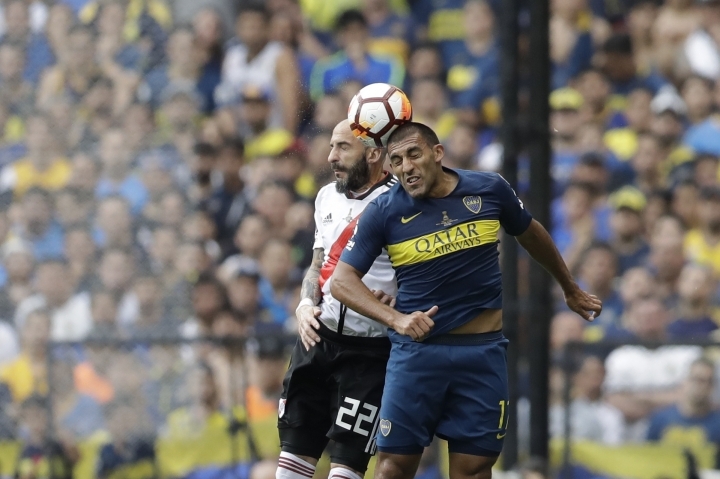 Boca could have won in the last minute of play when veteran striker Carlos Tevez broke through into the box and passed the ball to Benedetto, but his shot was blocked by River's Franco Armani, who is considered one of the best goalkeepers on the continent. "We were ahead twice and we couldn't hold the result," Boca coach Guillermo Barros Schelotto said at a news conference. "We had the game in our hands, but we let it escape from us." Coming back from behind twice felt like a triumph for River especially since coach Marcelo Gallardo missed the game. He had been sanctioned for failing to follow a previous suspension that banned him from contacting his players during the tournament's semifinals. 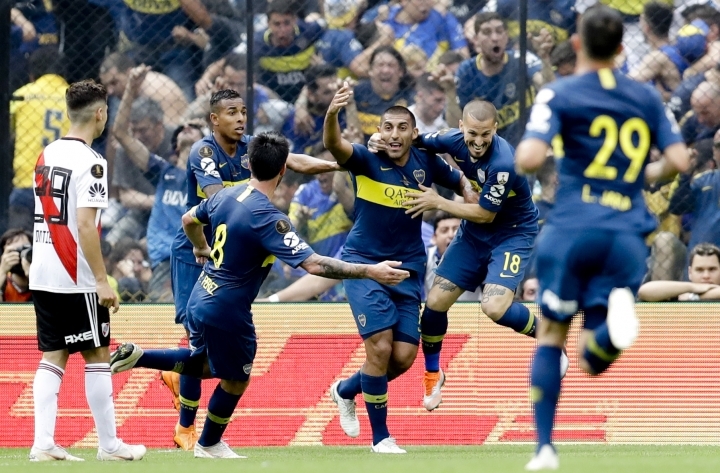 Boca has won the title six times, one behind Argentine club Independiente's South American record of seven titles. River has won it three times. The match was postponed Saturday because heavy rain flooded the field. The second leg will be played at River's Monumental de Nunez stadium on Nov. 24. "This will be settled at the Monumental," Pratto said. "It will be 'Kill or be killed.'"